Happy Friday everyone! Today is the day we are talking about my favorite things, moments, and fashion finds from the week! I had a few favorite moments from this past week but I didn't get a single picture. That is often the best times though, when you are so in the moment you don't think to grab your phone and snap proof to send to others. I encourage you to occasionally put your phone down and enjoy the moment. 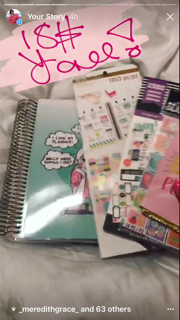 You guys, I am obsessed with all the things Michaels has regarding planners. I love this 3$ notepad for jotting down things I have to do each day along with their Recollection Planners which are almost exactly like Erin Condren planners. Not to mention they also have a ton of stickers and such too! Go watch my Instagram story today to see some of the stuff I am talking about. Needless to say, if your favorite pass time is making lists and plans (haha that's so nerdy of me to say! ), then you need to check our Michaels. My devotional post explaining how to have a quiet time with God has been a HUGE favorite this past week. The feedback has been great and I truly hope you try some of my recommendations. This girls blog has quickly became one of my favorites. I love that she shares on her Instagram story all the time about her favorite sales and fashion finds. Her blog and Instagram are fantastic and always affordable. I also love her hair! Y'all are well aware that the blue and white striped slides from Target are easily my favorite shoes so why not own them in black too? They are only 25$, comfy, and SO cute! 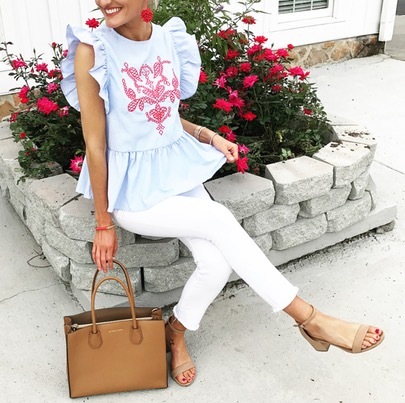 This top is so preppy and cute and looked adorable on Brittany from Loverly Grey. 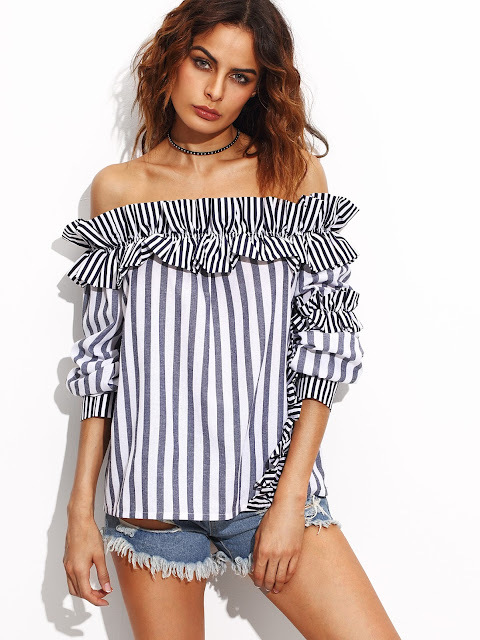 I might have to snag this cute top! It's only 13$! Y'all may remember a few weeks ago I mentioned on my Instagram Story that I had found a dress that looked a lot like the 245$ Tory Burch Dress except that it was only 12$. Now here is the deal, I read the reviews and many said that it ran super small, so instead of ordering a Medium like I usually would, I ordered a Large. However when it came in, it was so short I couldn't even bend over. It does fit my sister so here are pictures of her wearing the dress. My sister is tiny and usually wears an XS or S so the fact that the Large is barely long enough for her when she is so short and tiny says something. The quality of the dress is great and it is adorable but make sure to size up big time!! This top is being shipped to me right now and I am so excited to see how it looks. I like that it is asymmetrical with the ruffles and rather different looking. I can't wait for it to arrive and show it to you! I hope you enjoyed today's blog post! I will talk to you again on Monday!